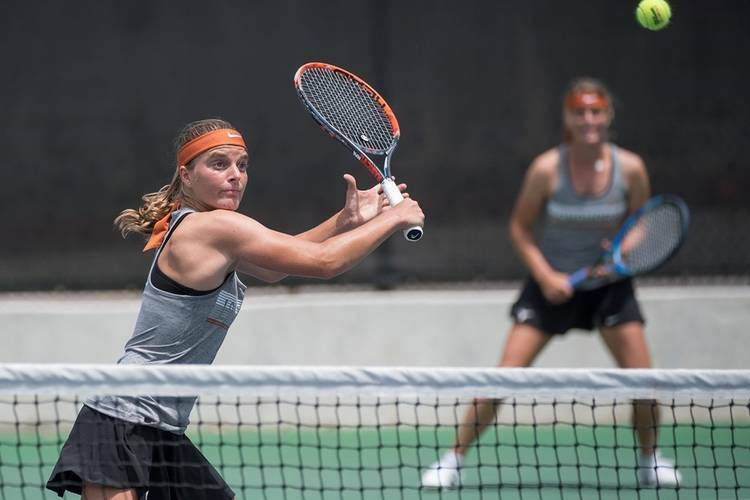 The Texas women’s tennis team made it a clean sweep to open the ITA Kickoff Weekend at the Texas Tennis Center Saturday. Texas took the doubles point and won three singles matches to defeat Middle Tennessee State 4-0 to start the dual-match season. Anna Turati and Bianca Turati won 6-1 over Lee Barnard and Marta Peris Herrero for the first doubles win. Fernanda Labraña and Bojana Marokovic topped Kim Kermet and Luisa Zirilli 7-5 to clinch the doubles point. Three straight-sets victories in singles competition sealed the win for Texas. Petra Granic defeated Lidia Burrows 6-1, 6-1 while Labraña bested Barnard 6-0, 6-2. Bianca Turati clinched the match with a 6-2, 6-0 win over Constanza Magazzini. The win sets up an ITA Kickoff Weekend championship match with Baylor Sunday at 1 p.m. The Bears defeated Wichita State 4-1. The winner of Sunday’s match advances to the ITA National Team Indoor Championships in Seattle, beginning Feb. 8.